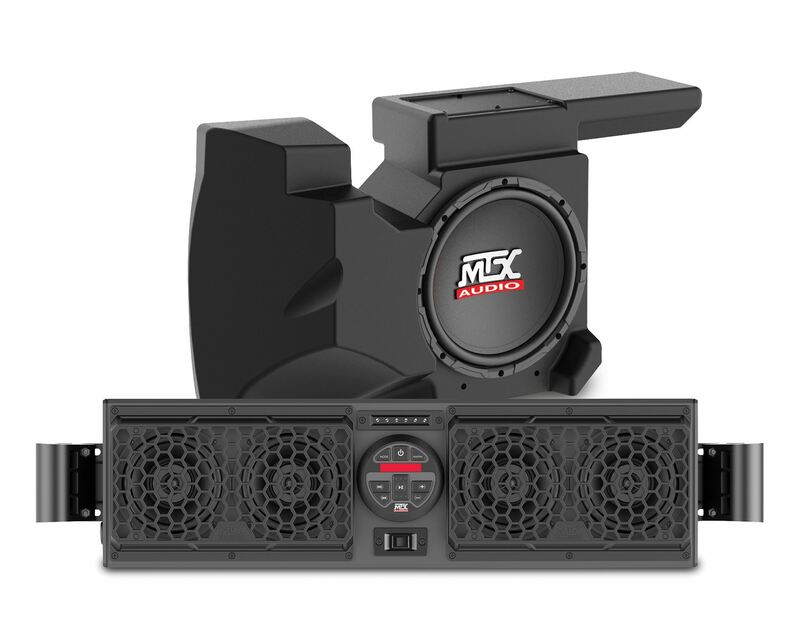 The MTX RZRBOAKIT1 audio system includes Bluetooth overhead audio system and custom fit powered subwoofer enclosure designed to deliver unbeatable high quality audio to UTV's that include mounting accessible roll cages with diameters between 1.75" and 2" like Polaris RZRs. This all weather system includes four 6.5" coaxial speakers that work in conjunction with an integrated 280-watt power amplifier and a single 10" subwoofer in an all-weather amplified enclosure. The MTX RZRBOAKIT1 audio package includes a Bluetooth overhead audio system and amplified subwoofer enclosure that delivers unbeatable, high-quality audio for Polaris RZRs. 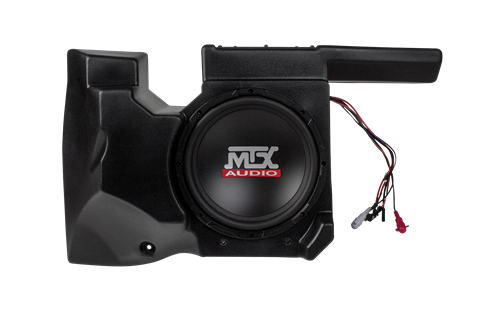 This all weather system includes the MUDSYS31 that includes four 6.5" coaxial speakers that work in conjunction with an integrated 280-watt power amplifier. Sources include Bluetooth, 3.5mm auxiliary, and a digital AM/FM radio that allow you to listen to your music however you want. The unit also includes a USB port for charging your device, a digital clock, and LED map light. The powered subwoofer enclosure, RZRXP-10, is custom fit to the RZR interior and produces the bass all music needs to get the party started. The MUDSYS31 mounts easily to roll cages with included hardware. With an IP66 all-weather rating, it will take the abuse of the trails and Mother Nature. The unit is prewired with power, ground, and accessory wires for easy installation and connection to your vehicle's electrical system. The RZRBOAKIT1 system is the perfect solution for Polaris RZR 900, 900S, 1000, XP1000, XP Turbo, XP4 1000, XP4 Turbo, and other machines with narrow cages.